I guess its time to start with the Christmas Arts and Crafts. 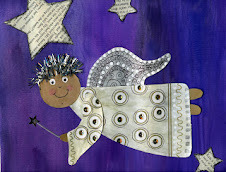 First up this tissue paper Angel...inspiration from Miss. P. at school...Thanks Miss. 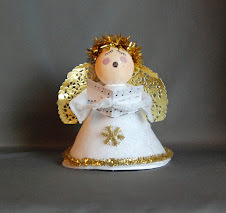 P.
We made 2 different sizes...a large 24" Angel to fill in those large empty spaces and a smaller 12" Angel which you can display in groups or use on cards. 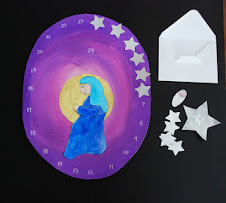 foil doilies, I get mine from the Dollar Store, for the large you need 8", the small needs 4"
Print off the templates...now google docs shrinks my templates by 20% so you can either enlarge them by that much on the photocopier or just use and make slightly smaller angels. Trace the head onto some thin cardboard or chipboard and cut out. Now you can paint these if you want or cover them with some paper and draw/color on the faces. I painted mine...you only have to paint one side. Take the wing template and trace onto white cardstock or whatever paper you want to use for your wings. Also trace out the arm template onto cardstock and color using the same method you chose for the face. You need to color both sides. For my large wings I decided to keep them white but added some feather detail with some white glitter glue. For the smaller wings I covered them with the foil leftover from the inside of the doilies...stay tuned you'll see where we cut it out. Make a nice Angel face on your head...our Angels have their eyes closed (they're at peace I tell the kids....asking them to give it a try). We then shaded our neck area with some diluted brown paint. Now we have to give our Angels their fancy halo/hairdos. For the large Angel we cut away the center portion of the 8" doily (this is where you can use the excess for the wings)...make a cut from the outside up to the center and then cut out. Put some glue on a few points of the doily and put in place tucking the bottom ends behind her shoulders. For the small Angel fold the 4" doily in half. Then cut the start of a heart shape...so you have a slit at the top of the center of the doily. Put some glue on the center of the doily and then slide the head in so her forehead is partially covered. 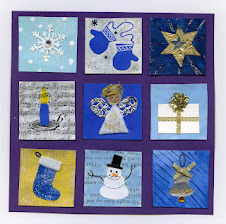 Turn your Angel over and glue the small angel arm piece along the bottom of the doily. For the large angel glue each arm into place. Then glue the wings in place on top of the arms. Your Angels should look like this now. Let the glue dry a bit. Take your tissue paper...for the small you need 1/4 of a sheet...for the large you need 2 1/2 sheets. Put a line of glue along the neck and then scrunch one of the short ends of the tissue paper into place. For the large Angels repeat this step with the second piece. Now you can fold the arms over like she is praying...you could glue them together if you want or add something for her to hold like a songbook or instrument. We left ours plain. If you want you can add a piece of trim to the neck for a necklace. You can now embellish like crazy if you wish. the small ones can be grouped together in a choir. Give it a try and make some Angels. I will be back soon with more Christmas ideas. I am so glad I found your blog. You have wonderful ideas. Have a wonderful Thanksgiving! They're beautiful! Thanks so much for sharing! Thanks for sharing with us! Mum to 8 from New Zealand! Making your paper chains tomorrow!! Your projects are so great. Thanks for all the ideas and inspiration. I am my daughter's room mother and in charge of the Christmas party. I would really like for it to be a memorable party and would like to know your opinion on a craft to do in a short amount of time. We will only have about an hour before they go home which doesn't make for a lot of drying time. Any suggestions would be appreciated. Thanks again for a wondderful blog! !